His Holiness the Fifth Karma Kuchen Rinpoche was recognized by His Holiness Dujom Rinpoche and Penor Rinpoche as the unmistaken incarnation of previous Karma Kuchen Rinpoche, Karma Thegchog Nyingpo. He was invited to Namdroling Monastery where Penor Rinpoche looked after him and provided him with basic religious education. Karma Kuchen Rinpoche excelled in all the monastic training and mastered all the traditional knowledge of The Palyul Lineage. He also received numerous Nyingma Teachings from great masters such as His Holiness Dilgo Khyentse Rinpoche and Penor Rinpoche. Keeping in view of his wonderful qualities of a master, His Holiness Penor Rinpoche appointed him as the Head of the Palyul Mother Monastery in Tibet in 1994. 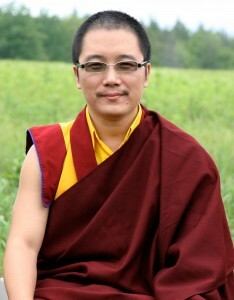 On 14 August 2000, he was formally enthroned as the lineage holder of the Palyul Tradition and is now the 12th throne holder of The Palyul Lineage. Penor Rinpoche on many occasions appreciated his efforts in holding the pure lineage of Palyul tradition and dissemination of Buddha Dharma in the Land of Snows. The significant achievement of Karma Kuchen Rinpoche since his arrival in Tibet was that he had built many temples, stupas, prayer wheels, images of deities and other objects of veneration and faith. Under the direction of His Holiness Penor Rinpoche, he has built a very grand and magnificent temple within the monastery premises. Of the many remarkable qualities that he possesses, the most striking quality is his strict and pure observance of all the vows of a monk. He is thus the embodiment of pure conduct in these degenerate times.